Thank you! Please check your inbox for download link and tips to get started. A timeline is a type of chart which visually shows a series of events in chronological order over a linear timescale. 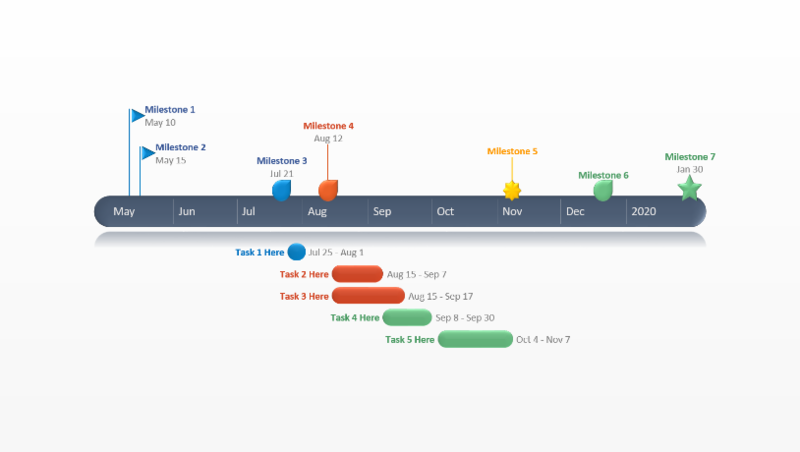 The power of a timeline is that it is graphical, which makes it easy to understand critical milestones, such as the progress of a project schedule. 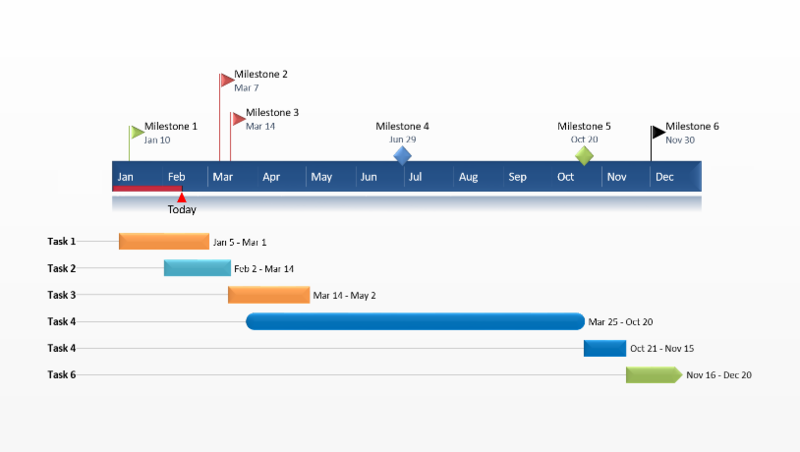 Timelines are particularly powerful for project scheduling or project management when paired with a gantt chart as shown at the end of this article. 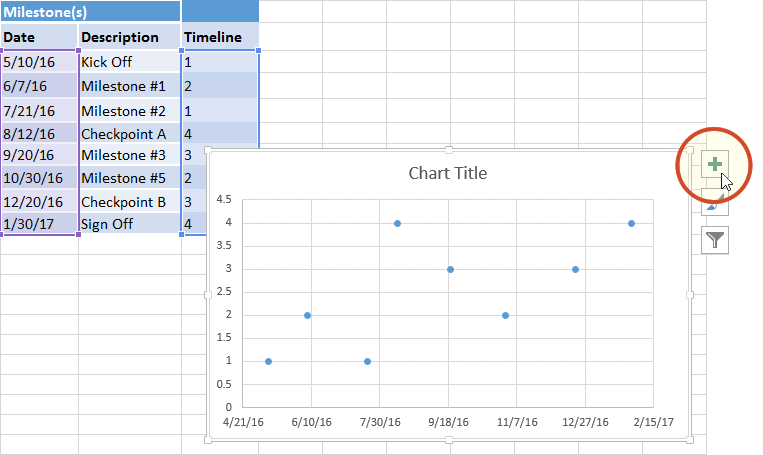 Microsoft Excel has a Scatter chart that can be formatted to create a timeline. If you need to create and update a timeline for recurring communications to clients and executives, it will be simpler and faster to create a PowerPoint timeline. On this page you can see both ways. 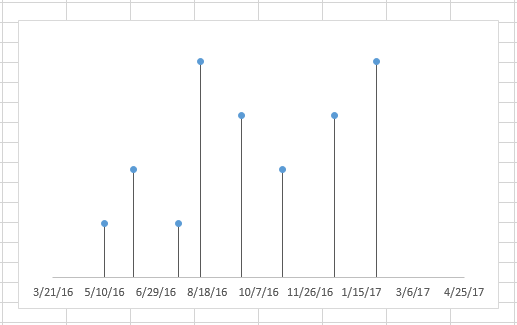 I will give you step-by-step instructions for making a timeline in Excel by formatting a Scatter chart. 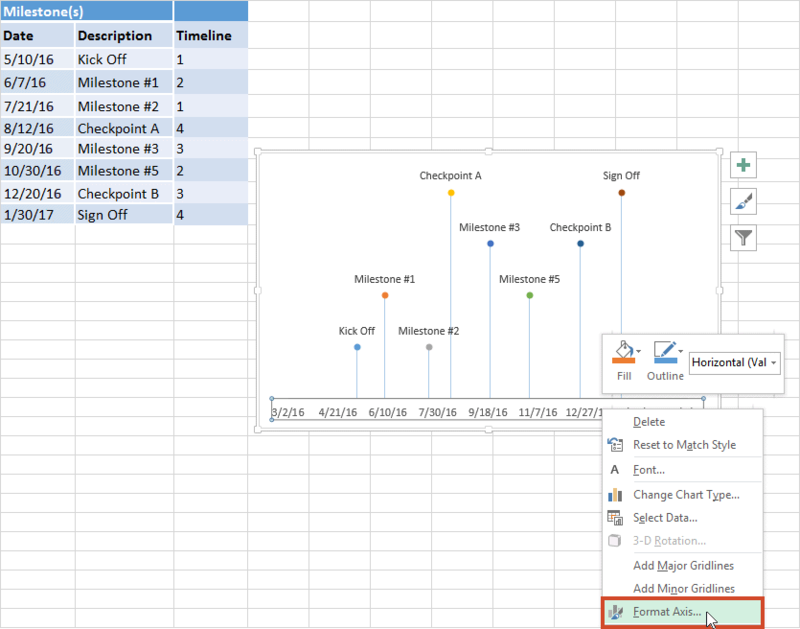 I will also show you how to instantly create an executive timeline in PowerPoint by pasting from Excel. Which tutorial would you like to see? List out the key events, important decision points or critical deliverables of your project. 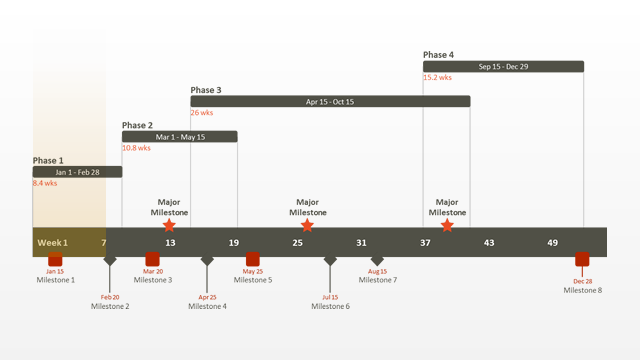 These will be called Milestones and they will be used to create a timeline. 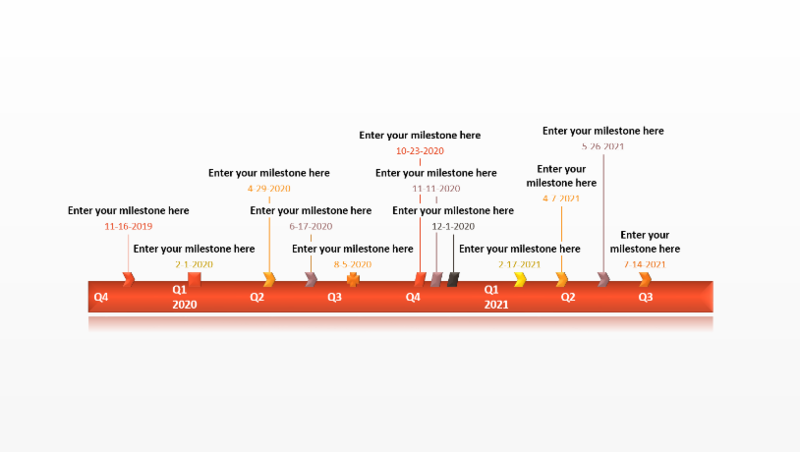 In Excel 2007, 2010, 2013 and 2016 create a table out of these Milestones and next to each milestone add the due date of that particular milestone. 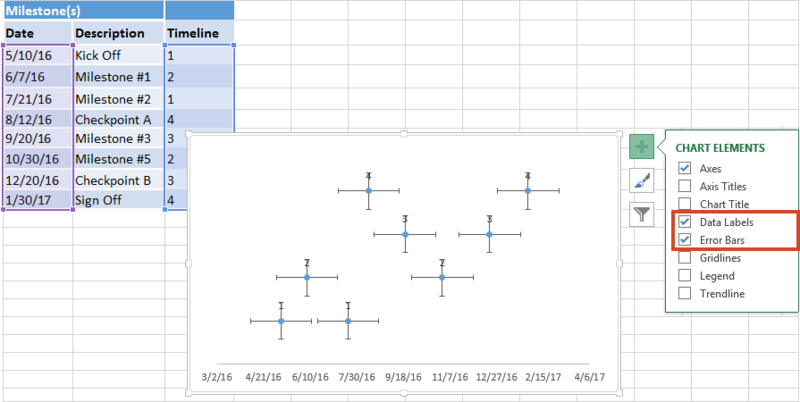 To create a timeline in Excel, you will also need to add another column to your table that includes some plotting numbers. Add the new column next to your milestone description column and list out a repetitive sequence of numbers such as 1, 2, 3, 4 or 5, 10, 15, 20 ect. See my example below. 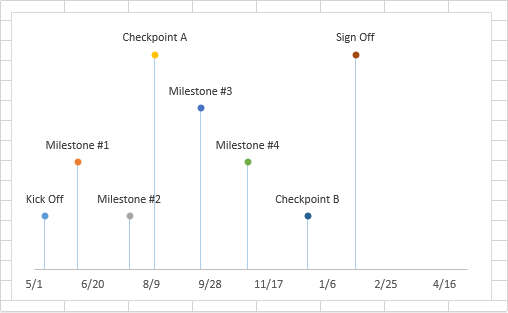 Excel will use these plotting points to vary the height of each milestone when plotting them on your timeline template. 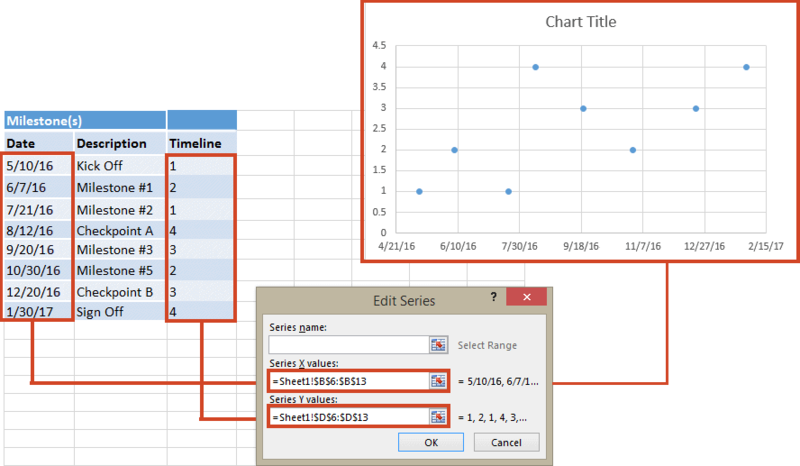 For this demonstration I will format the table in the image below into a Scatter chart and then into an Excel timeline. Then I will use it again to make a timeline in PowerPoint. 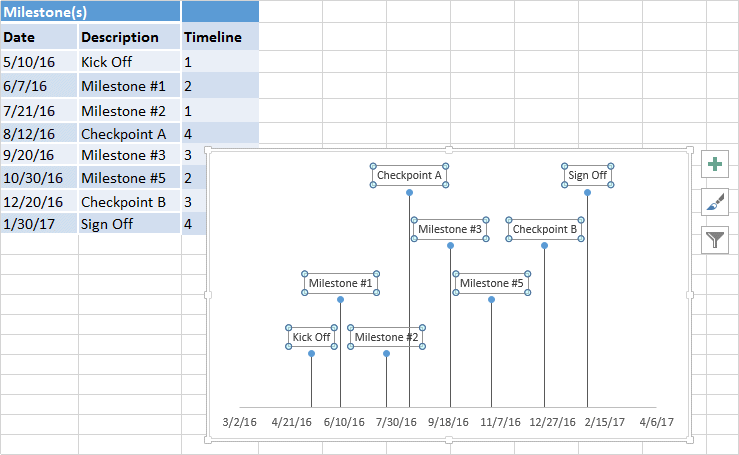 From the timeline worksheet in Excel, click in any blank cell. Then from the Excel ribbon, select the Insert tab and navigate to the Charts section of the ribbon. In the Charts section of the ribbon drop down the Scatter or Bubble Chart menu. 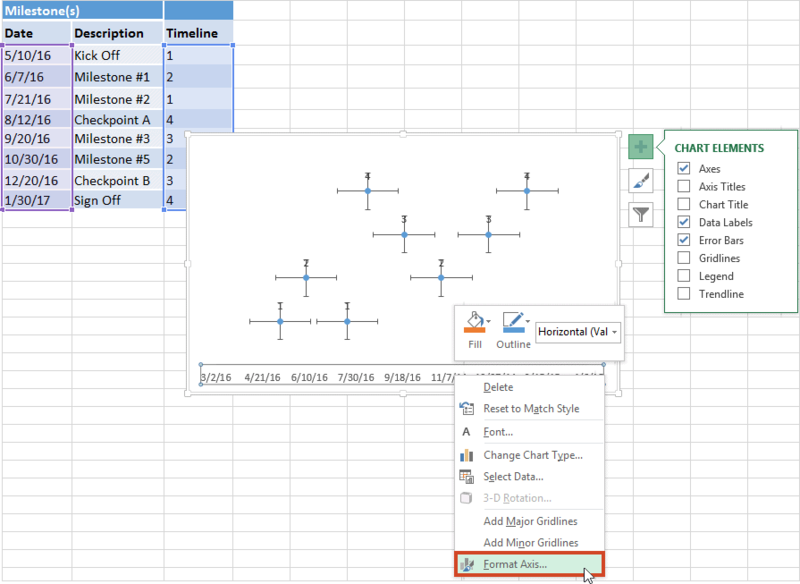 Select Scatter which will insert a blank white chart space onto your Excel worksheet. Right-click the blank white chart and click Select Data to bring up Excel's Select Data Source window. On the left side of Excel's Data Source window you will see a table named Legend Entries (Series). Click on the Add button to bring up the Edit Series window. Here you add the dates that will make your timeline. We will enter the dates into the field named Series X values . Click in the Series X values window on the tiny spreadsheet . Then select your range by clicking the first date of your timeline (mine is 5/10/2016) and dragging down to the last date (mine is 1/30/2017). Staying in the Edit Series window move down to Series Y value. This is where you will enter the plotting numbers you added to your table. 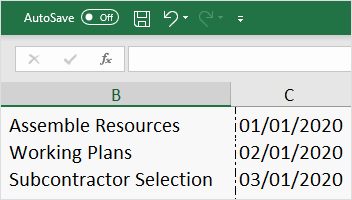 Click in the Series Y value window and remove the value that Excel places in the field by default. Then select your range by clicking on the first plotting number of your timeline (mine is 1) and then dragging down to the last plotting number of your timeline (mine is 4). Now, both Series X and Series Y values should be populated as in the image below. Click OK and then click OK again to create a scatter chart. Click on your chart to bring up a set of controls which will be presented to the upper right of your timeline's chart. Click on the Plus button (+) to open the Chart Elements menu. In the timeline's Chart Elements control box, uncheck Gridlines and Chart Title. Staying in the Charts Elements control box, hover your mouse over the word Axes (but don't uncheck it) to get an expansion arrow just to the right. 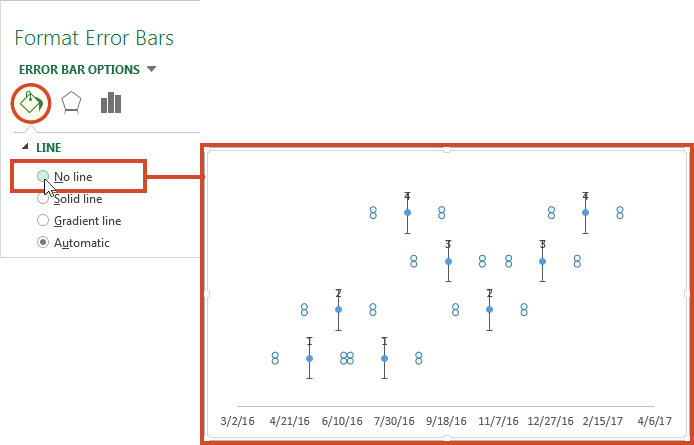 Click on the expansion arrow to get additional axis options for your chart. Here you should uncheck Primary Vertical but leave Primary Horizontal checked. Staying in the Charts Elements control box just a little longer, add Data Labels and Error Bars. Your timeline chart should now look something like this. 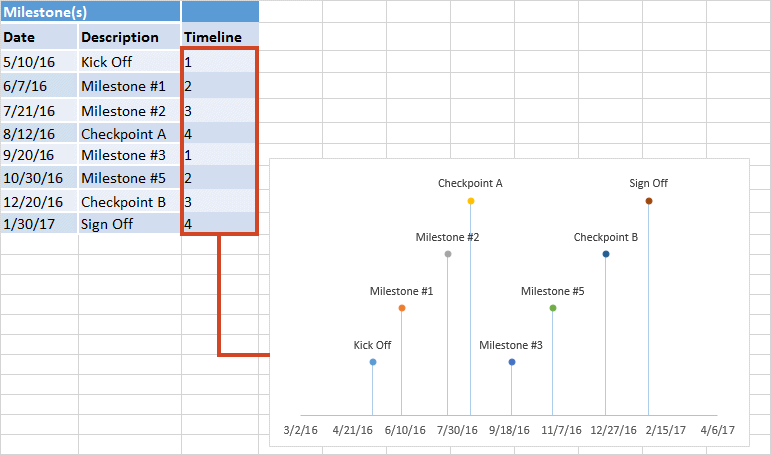 To make a timeline in Excel, we will need to format the Scatter chart by adding connectors from your milestone points. 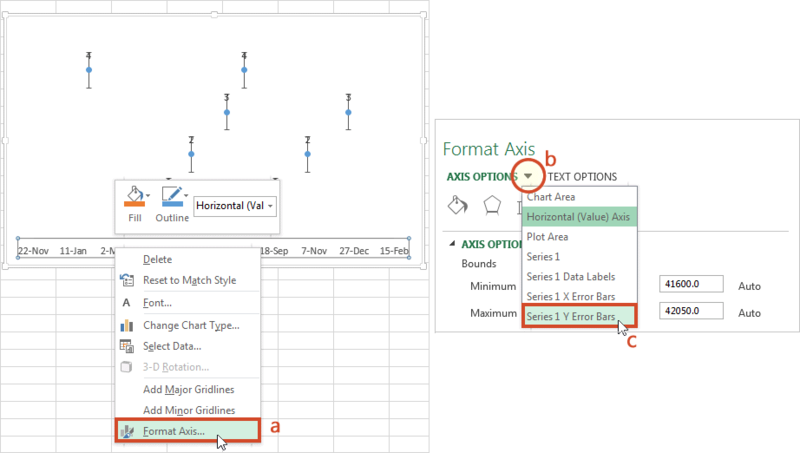 Right-click on any one of the dates at the bottom of your timeline and select Format Axis to bring up Excel's Format Axis menu. 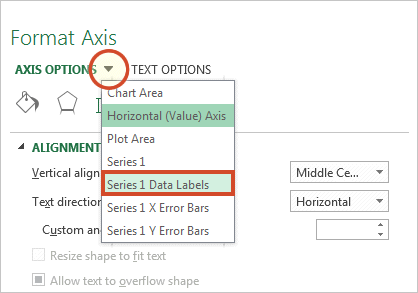 Drop down the arrow next to the title Axis Options, and select Series 1 X Error Bars. Under the Error Bar Options menu, click on the paint can icon to reveal the Fill & Line controls. 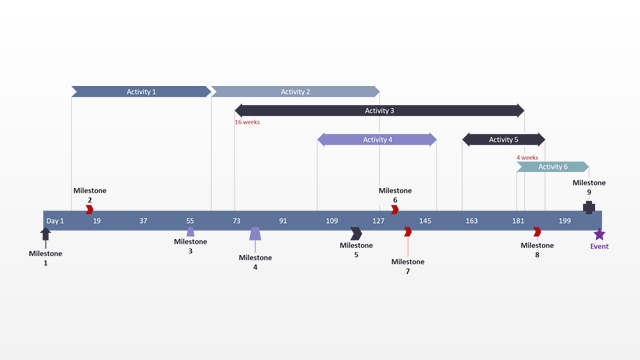 Select No line, which will remove the horizontal lines around each of the plotted milestones on your timeline. In a similar process, we will also adjust your timeline's Y axis. Again from the timeline, right-click on any one of your timeline's dates at the bottom of the chart and select Format Axis. 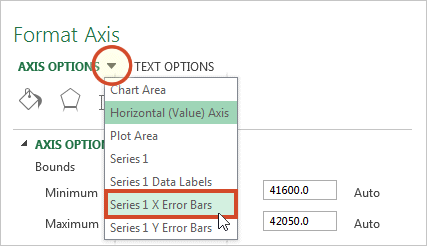 Drop down the arrow next to the title Axis Options, and select Series 1 Y Error Bars. 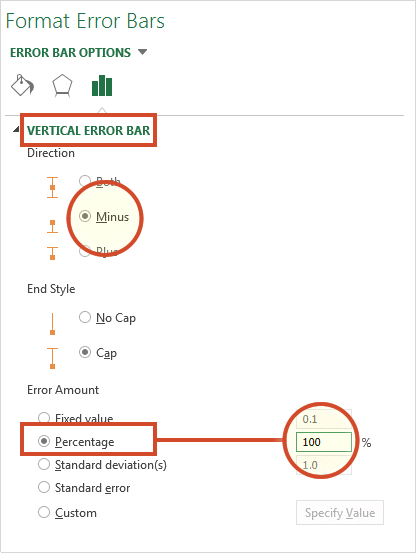 From the Vertical Error Bar menu in Excel, set the direction to Minus. Then set the Error Amount to Percentage, and type in 100%. This will make connectors from your timeline's milestones to their respective points on your timeband. Your Excel timeline should now look something like the picture below. 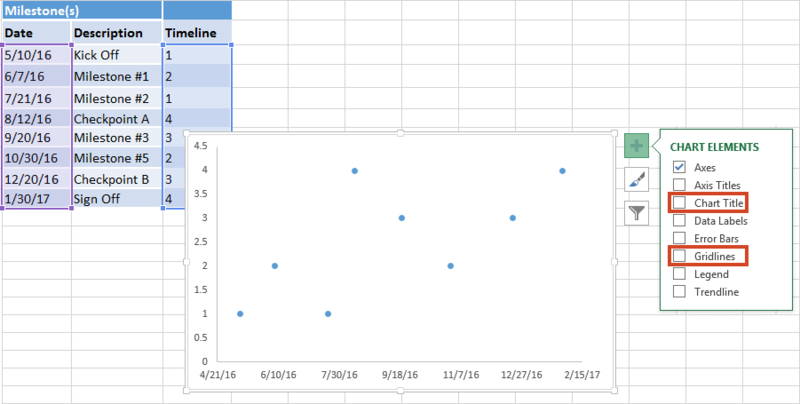 You have built a Scatter chart as an Excel timeline. Now we will format it into a proper timeline. To finish making your timeline, we will add the milestone descriptions. Staying in the Format Axis menu, again drop down the menu arrow next to the title Axis Options. 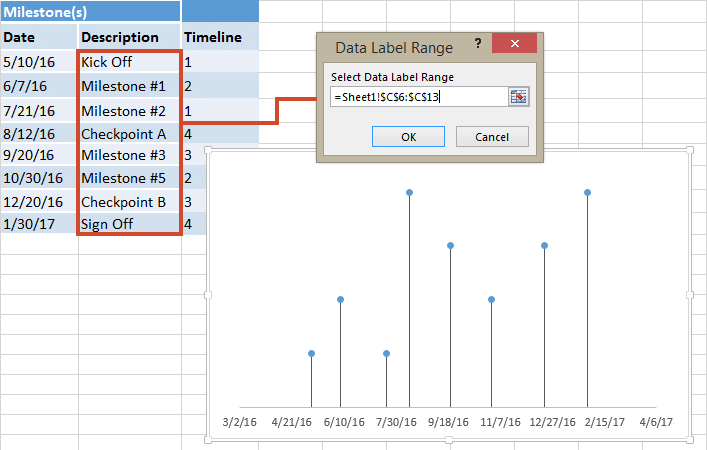 This time choose select Series 1 Data Labels to bring up the Format Data Labels menu. Click the Label Options icon. Uncheck Y Value, and then put a check next to Value From Cells. 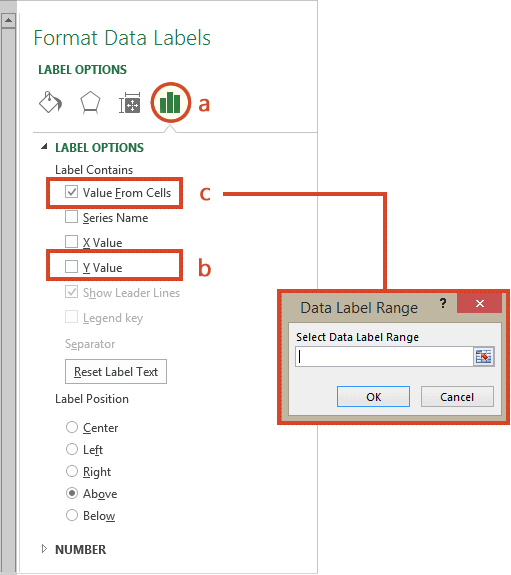 This will bring up an Excel data entry window called Data label Range. In the Select Data Range window you will enter your timeline's milestone descriptions from the timeline table you built in step 1. To do this simply click on the description for the first milestone in your timeline table, (mine is Kick Off), then drag down to the last milestone in your timeline (mine is Sign Off). Click OK. Your Excel timeline template should finally look more like this now. Now you can apply some styling choices to get your timeline looking better. Coloring your timeline's milestone markers. From your timeline, right-click on any of the milestone points (caps) and select Format Data Series to bring up the Series Options menu. Select the paint can icon for Fill & Line options and then choose the tab for Marker. You may also need to select Fill to reveal its menu. 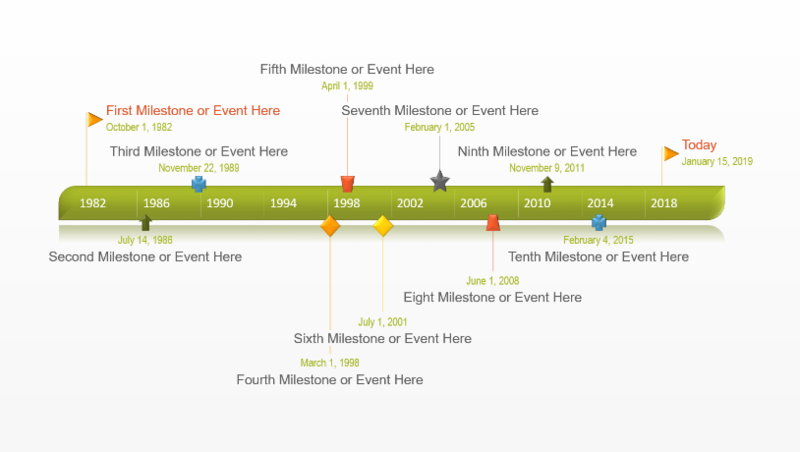 Then you can choose coloring options for you timeline's milestone markers. In my example, I selected Vary colors by point, which lets Excel pick the milestone colors for my timeline. Change the vertical connector's transparency. On your timeline, right-click on any of the vertical connectors that connect your milestones with the timeband below. Select Format Error Bars to bring up the Vertical Error Bar menu. 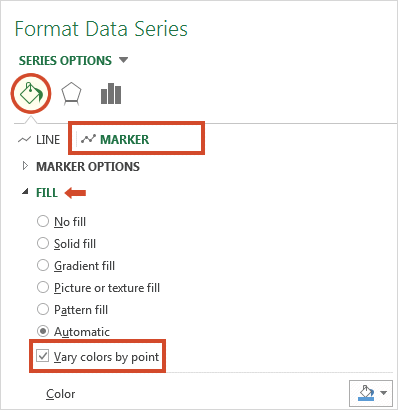 Again select the paint can icon to choose Excel's Line & Fill options. Here you can make formatting adjustments (color, size, style, etc.) to your timeline's connector lines. In my example I set the transparency of the lines to 50%. Vary the height of each milestone so their descriptions are not overlapping the neighboring milestone. Remember the repeated sequence of numbers you added to your timeline table in step 1. Well those set the height of each milestone on your timeline. By adjusting these numbers, you can play around with different height positions for each milestone. For example, to optimize my timeline, I used the number sequence, 1, 2, 3, 4, 1, 2, 3, 4. 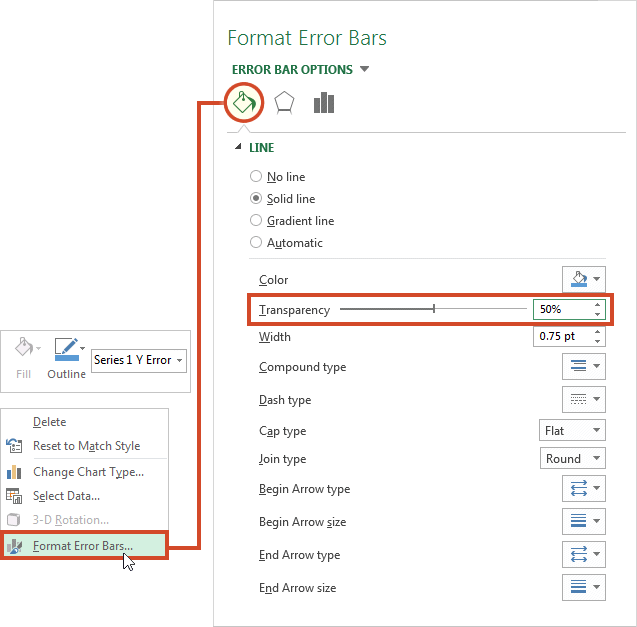 Trim off the empty space to the left or right of your excel timeline by adjusting its minimum and maximum bounds. Again right-click on any of the dates below your timeband. 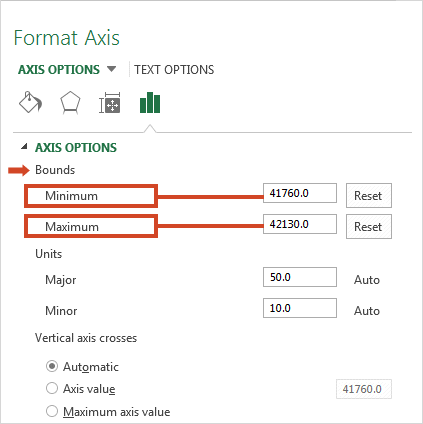 Select Format Axis. Under the heading Bounds, adjusting the Minimum number upward will move your first milestone left on your timeline, closer to the vertical Axis. Likewise, adjusting the Maximum number down will move your last milestone right on your timeline, closer to the right edge of your chart. PowerPoint is better suited than Excel for making impressive timelines that clients and executives want to see. 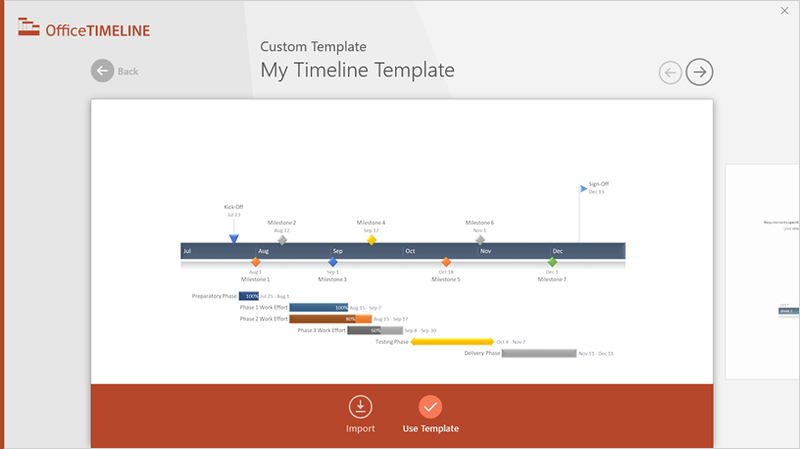 Office Timeline is a PowerPoint add-in that instantly makes and updates timelines from Excel. 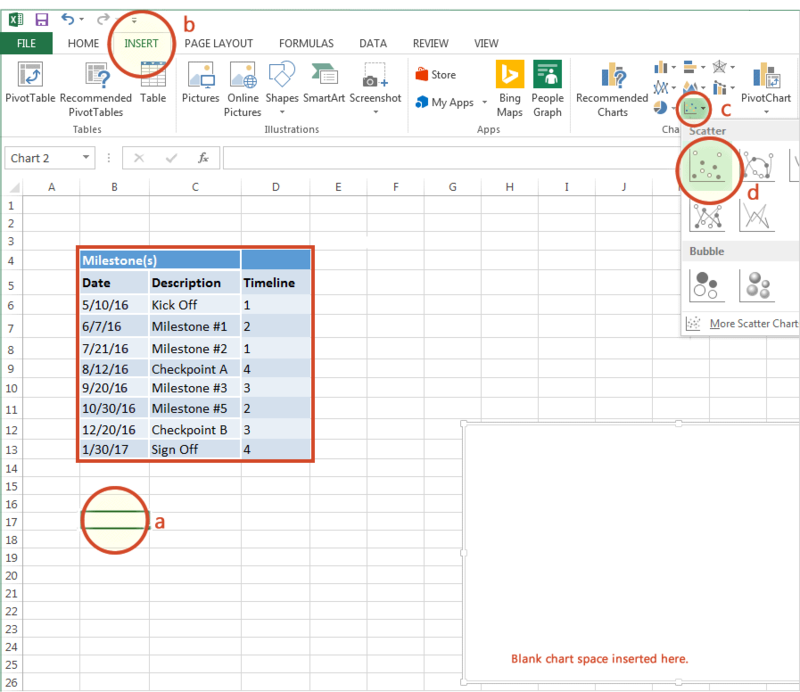 In the tutorial below, I will demonstrate how to quickly paste the Excel table you created above in Step 1 into PowerPoint using Office Timeline Plus. 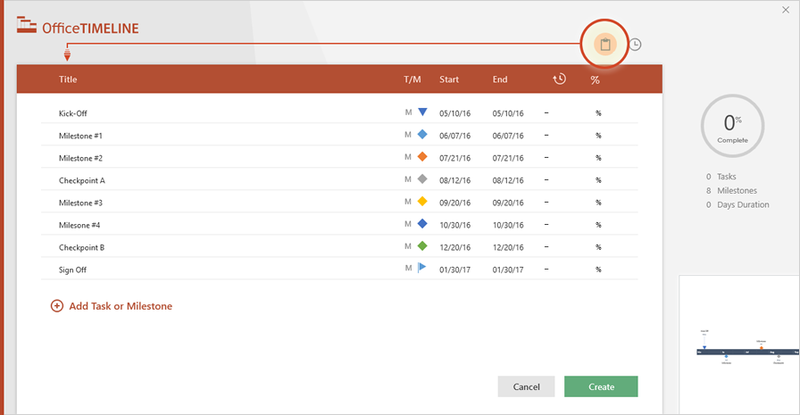 To begin you will need to install Office Timeline Plus, which will add a timeline creator tab to PowerPoint. 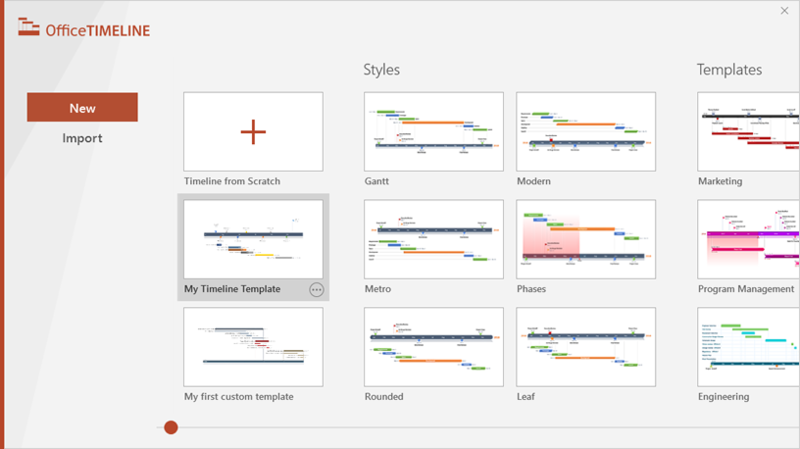 Inside PowerPoint, click on the Office Timeline Plus tab, and then click the New icon. This will open a gallery where you can choose between various timeline styles, stock templates and even custom templates. From the gallery, double-click the style or template you wish to use for your timeline to open its preview window and then select Use Template. For this demonstration, I will choose a custom template. If you prefer to import and sync your Excel table, rather than copy-paste, click on the Import button in the preview window. 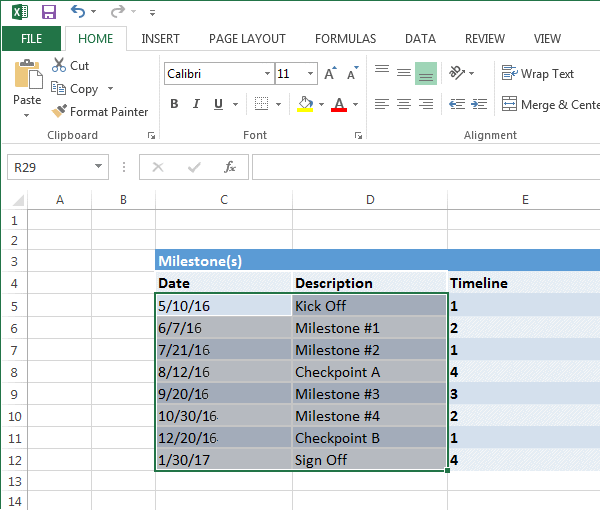 Copy the milestone dates and descriptions from your Excel table. Copy them all at once, but make sure not to include the column headers. 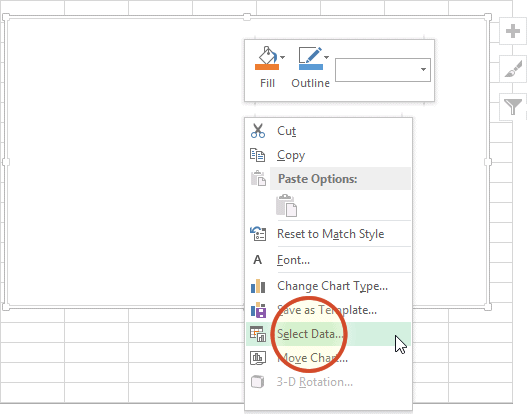 Now, simply paste the section into PowerPoint by using the Office Timeline Plus Paste button in the upper-right corner of the Data Entry wizard. Make edits if necessary (such as changing milestone shapes and colors or adding and removing items) and click the Create button. Make a timeline from Excel data in under 1 minute.